The Rote Fabrik is easily reached off highway 3. There is a car park 100 m north on the Seestrasse, however, capacity is limited. Visitors are recommended to come by public transport. Train station Zurich Wollishofen is only a few hundred meters away. 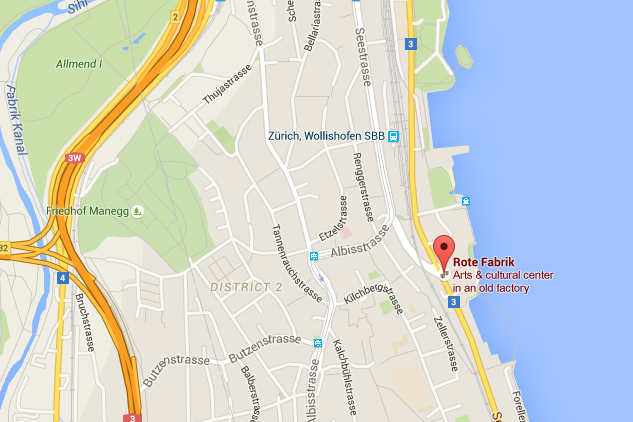 There is a “Rote Fabrik” bus stop right in front of the building. Bus lines 161, 165 and N15 stop there. There are a few hotels in walking distance, check on Google Maps. If you’re not big on luxury, the Zurich Youth Hostel (Jugendherberge Zurich) is strongly recommended. Very near to the event, fair prices, good reputation. All good. Unfortunately, there is no possibility for sleeping at the festival grounds. Regulations, you see?